Over the years I’ve worked on literally hundreds of natural turf cricket pitches, ranging from village grounds to first class and International venues. When surveying these pitches, assessing their fitness for purpose and making recommendations for works to remedy key issues, I’ve always mulled over how to best to explain, in simple terms, the options for cricket pitch works to the club man and groundsman. A couple of years ago I sat down and did exactly that; creating a document that defines works into four key categories – or processes – and which has subsequently been agreed a good structure by ECB Pitch Consultant Chris Woods. This feature looks in detail at each of these processes – End of Season Renovation, Table Construction (Full Pitch and Profile), Square Restoration and Profile Regeneration – highlighting the kind of issues that each can help to remedy any limitations. The processes range in scope from regular end of season works for natural turf cricket tables through to the construction of a brand new cricket table to remedy even the most severe of problem pitches. The intermediary processes offer revolutionary solutions that can help address issues such as uneven surface levels, saddling, thatch and profile layering with immediate improvement to performance. While any process would need the fine detail tweaking to suit the individual attributes of the pitch in question, these definitions should provide club groundsmen with a good insight into what works they should plan for. These vital ‘end of season works’ are completed following the end of the playing season and provide the foundation for the next season’s playing surface. The main aim is to repair damage caused during the playing season – such as improving surface levels and grass coverage – with works carried out at the optimum time of year to control organic matter content in the surface. The sequence of works starts with the grass sward being cut as short as possible prior to scarification to remove organic matter, relieve soil tension, remove high areas and create grooves; with all debris completely removed using blowers or powered brushes. The grooves created by the scarifier are then used to combine the seed and top dressing into the surface, giving a seed-to-soil connection. Seed should be applied evenly to the cricket table using a cyclone spreader or dimple seeder followed by a loam selected for the site. Loam may be applied using belt or brush-driven top dressers, by hand casting or with a straight edge. The aim is to a cover the seed and bring up surface levels without smothering the existing grass plant and creating layers. The amount of loam used will be determined by surface levels and the depth of scarification grooves. Once the loam has been laid, fertiliser can be applied; the type and composition of which will depend on results of a soil test and should be applied using a cyclone spreader. These works are vital in producing good pitches and should be planned and completed as soon as possible after the playing season; maximising potential growth prior to play commencing the following season. 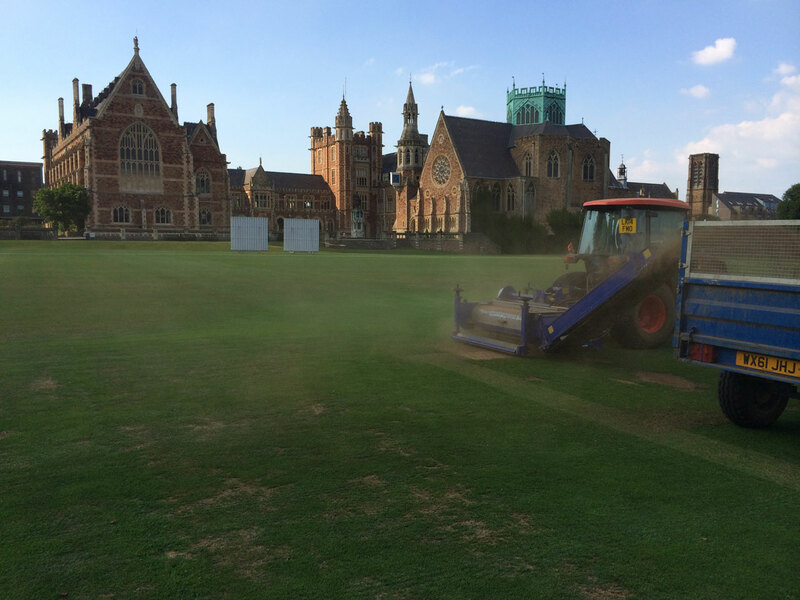 The restoration process should be seen as a more aggressive operation and one step further than a typical end of season works, which can be used to correct the most commonly seen faults of an established natural turf cricket square. The process results in an immediate improvement to performance and will enable the square to be used the following season. The most common issues it can help combat are a thatch layer, uneven surface levels and poor grass coverage. In addition to restoring the playing surface, the restoration process can also be used to incorporate a new loam. Restoration works would include fraise mowing to remove the organic layer (thatch) and the grass sward. This operation would use machinery commonly known as a “Koro”. The surface would also be linear aerated using machinery with contra-rotating vertical blades approximately 3mm wide. Vertical blades cut into the surface to relieve soil tension, remove high areas and create grooves. This operation helps fraise mowing by loosening up the ground, while the grooves and material which are created aids soil amelioration and over seeding. Severe surface levels (+ 80 mm over 3m), or ‘saddles,’ can also be removed by multiple passes of the linear aerator, surface planer or another type of powered cultivator. The process of regeneration and profile recycling has been designed to bridge the gap between surface works and pitch construction. It is a hybrid the two; and should be viewed as ‘going a stage further’ than the restoration process. Where conditions allow, it acts as a cost-effective alternative to construction as it can solve many of the same problems – such as severe issues with levels and profile layering. 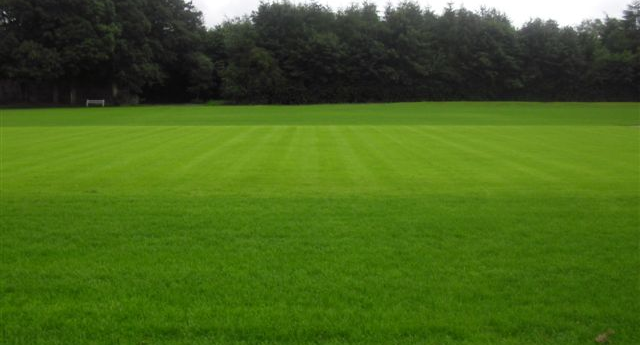 Regeneration results in an immediate improvement to cricket square performance and will enable the square to be used the following season, thus avoiding the delays often associated with construction works. It is, however, restricted to a depth of 80-100 mm. In ‘profile recycling’, rather than importing and exporting materials, on-site soils are utilised. Organic matter is removed from the surface and the existing underlying soil is cultivated. The process is purely dependant on site soil types and depths and employs machinery used in both construction and restoration, thus requires a high level of understanding by the contractor. Surface regeneration works, including profile recycling, can be a cost-effective solution to breathe new life into old squares, creating the equivalent to a newly constructed table. It is not, however, a ‘fix all’ solution – the site’s topography, native soil type and a host of other factors need to be taken into account when deciding whether this option is viable. To complete the series on end of season works, we now look at the most drastic solution to severe cricket pitch issues – the construction of an entirely new cricket table. Due to the expense and time constraints involved, this is really seen as a ‘last resort’ – only completed when a new ground is being built or an existing playing surface cannot be brought back to the required standard by any other means. New squares are designed and built in two ways; either a ‘Full Construction’ or a ‘Profile Construction’. A full construction design incorporates a gravel raft, binding layer and loam. A typical profile depth would range between 400-450 mm. The gravel raft is used to create stability, with an angular primary stone used to support the loam profile and reduce the risk of settlement. In some cases, a gravel raft can also help drainage when used in connection with a perimeter ring drain. A profile construction design uses only imported loam directly on the site’s existing soil base, with a typical profile depth ranging between 100-250 mm. Whichever construction method is decided upon, the use of laser-guided machinery is recommended. Modern laser guided machinery performs better than traditional methods i.e. compaction rates, surface gradients, surface levels, material quantities. Construction projects greater than 75mm in depth should be granted a twelve to eighteen-month period for establishment. This naturally means that the newly constructed natural turf cricket table will be out of use for a full playing season, which is why it is recommended only in the most severe cases.